An open source linear bearing for CNC equipment that is low cost and extremely easy to integrate into your design. 269 backers pledged $26,268 to help bring this project to life. Sorry about the lame video. I am not very good at that kind of thing, but I am good at designing and building CNC and digital fabrication equipment. I have a great idea for a linear bearing system. I hope you will take the time to hear/read my pitch and consider donating to this project. A big cost driver and fabrication hurdle for home built CNC equipment is the linear bearing system. Commercial systems are expensive. Available lengths are often limited to set increments that do not always fit well with your design and the price rises quickly with the longer lengths. There are eBay deals, but it is not a good idea to base an open source project on lucky eBay finds. There are hundreds of DIY methods. People have used rollerblade bearings on tubing, sliders on shafts, aluminum and steel angles, drawer slides, and scanner parts. Many of these actually work fairly well. They take a little initial tuning maybe a few adjustments over time, but for the most parts they meet the needs of the builder. Unfortunately, they can be difficult and time consuming to fabricate. My proposal is to create a standardized replacement for a lot of those solutions. The goal is to be better, a lot cheaper and a lot easier. The concept is a reduced cost version of the v groove bearing system, integrated into a basic millimeter based t slot system. It will use Delrin v wheels. The v groove system has the advantage over many other systems in that it holds true in several axes at the same time. As opposed to many systems that do not resist twist. I know there are commercial system similar to this. I have used many of them. 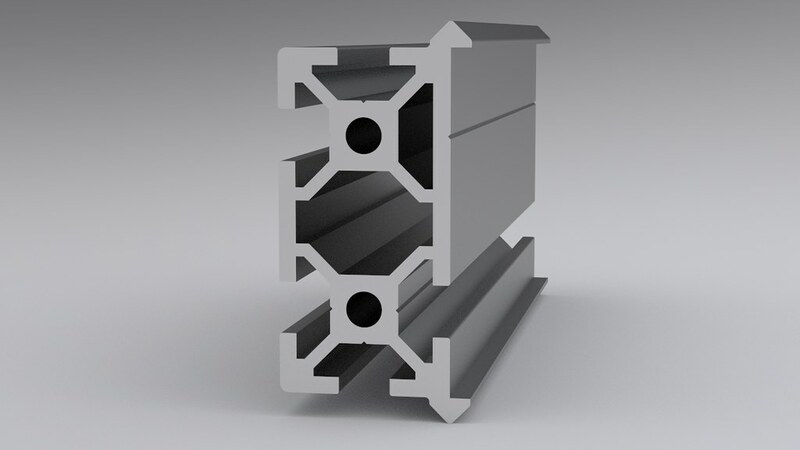 They all cost a lot more and are not fully compatible with standard extrusion systems. My goal is a sell price of $0.10 per centimeter. That puts a full 4 foot system with carriage and wheels at less than $20. The material can be ordered to length or cut with home tools such as a hacksaw, band saw or chop saw with an appropriate blade. A builder or Hacker Space might keep a several feet on hand and cut to length for quick projects. This is available to any level supporter. Submit a new, innovative or interesting open source design or basic idea that uses the material and I will supply enough to build a prototype. You pay for shipping only. All you need to do is submit something visually presentable, via sketch, rendering, etc. The purpose is to generate a little excitement and some good ideas. All worthy ideas will be posted. A building sized XY plotter might be a great idea, but prototyping it a smaller scale would be a better idea :-) I will be the sole final judge of winners and there is no preset maximum or minimum number of winners. Thanks from me - A Mention on the Backer Page - Priority access to buy from first production run - Access to the "MakerShip" program. Laser marked piece plus 12 feet of raw material plus enough wheels and brackets to build a simple system. The laser marked piece plus a mid sized kit with various lengths of material plus a bunch of wheels and bearings. The laser marked piece plus a large sized kit with various lengths of material plus a bunch of wheels and bearings. The laser marked piece plus a large kit and free access to the extrusion tool if you ever wanted to buy tons of material at cost to sell full CNC kits. (Not for resale of raw material or basic slide kits).